LP and her eye surgeon, Dr. Klys. So let’s add up the weeks. An eye ulcer in May, another one in October – that’s somewhere around five months in a cone for 2012. I’m going to put her in a bubble, I swear. Now, if you’ll excuse us, we have some sniffing and running and playing to catch up on…. I see Lola in a Victoria ruffle with sewn in pearls and sequence around her neck. I will start work now on this year’s Halloween costume. Roxy needs the calming influence of her classy friend. Here here! We are with you on the eye issues. 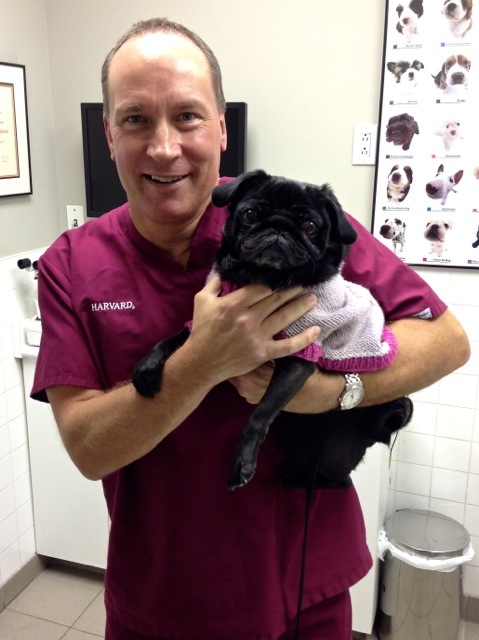 Thank pug Tallulah hasn’t needed the cone for her 3 ulcers in 2012 or the 1 already in 2013! Mom is threatening to make Tallulah wear Doggles! Oh, Tallulah, you had THREE ulcers? How did they get better? Mama says I’m going to wear a special bubble suit, and then she laughs. She’s only funny to herself. Yay, Lola! And it’s lovely how you and your vet colour coordinated for this photo. Let’s hope 2013 is cone free! My best royal subjects always colour coordinate to my outfit choices! Here’s to 2013! The only thing that heals them are a serum made from her blood. Gross but effective. We don’t even bother with the gel stuff anymore. Hurray!! Have lots of fun!! Congrats on your de-coning! You have a nice dogtor! I sure like him, Loki. My heart is always with my Uncle Deji – my regular vet – but there’s room for other people who are nice to me, too. Cone free! Cone free! Cone free! Cute sweater, by the way! Thanks, Willow! My Grandma made it for me. Mama saves the Grandma sweaters for the most special occasions – when I need angel juju (or when I need to just look super cute). ps – mama loves your Tumblr site. She says you are *super* cute.